“Man on a Ledge” follows an escaped felon, Nick Cassidy (Sam Worthington), who, as the title suggests, climbs out on the ledge of a tall New York building and threatens to jump, attracting mass media and passerby attention. Two years ago, Nick was convicted of stealing a precious diamond from David Englander (Ed Harris), one of New York’s wealthiest, but Nick maintains that he was framed, and has climbed out on that ledge as part of an elaborate shell game meant to prove his innocence. That’s all I’m willing to tell you about the story. I feel the trailers have given a bit too much away. Isn’t the idea that a man has gotten on a ledge to prove a point enough of a hook? Why spoil events from the second act? The idea, after all, is a pretty good one, and writer Pablo Fenjves gets quite a bit of mileage out of it, hooking us right from the start with a number of intriguing mysteries and keeping us engaged through to the end. The various scenarios that keep the story moving all feel organic (if not always plausible), and more importantly, they all generate strong amounts of tension. And while the film certainly has its fair share of clichés, and there’s nothing particularly surprising about how the story unfolds, “Man on a Ledge” is still a unique idea at heart, and Fenjves is creative enough to keep the story feeling fresh throughout. 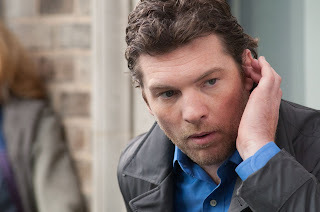 Elizabeth Banks plays a Mediator sent to convince Sam Worthington to get off that ledge, and while Banks is great in the role, Fenjves apparently couldn’t be bothered to research how a mediator actually operates. So she comes across, for the first half hour or so, as the most pathetic mediator on the planet, her questions and prodding and words of encouragement hilariously useless. And I laughed heartily at much of her dialogue. Since Worthington’s character is out to prove a point, he obviously doesn’t jump, and yet it takes everyone in the movie a long damn to question his motives. This leads to one of the funnier moments, as Elizabeth Banks shares an idea with one of her colleagues. My paraphrased version: Banks: He’s a jumper, right? Cop: Yeah. Banks: But he’s not jumping, right? Cop: No, he’s not. Banks: Hmm. I think there’s a chance he’s not trying to kill himself. Cop: Egads! You’re brilliant!!! And I laughed heartily. Then there’s a long-running, lingering plot hole where nobody in the movie recognizes Worthington’s character, even though he escaped prison in a rather theatrical fashion and most of the characters in the movie are cops. That made me chuckle a few times. Or a scene where a news chopper flies up right next to the man on the ledge, nearly killing him, and somehow, nobody involved is reprimanded in the slightest. And I laughed heartily. Or a scene where a character crawls through the ventilation systems of a building, but breaks down in fear, and tearfully pleads to go back. Others urge her to go on. The tension builds and builds and builds…finally, she moves one inch forward, and…she’s there, at her destination, and drops down. Oh, I laughed moste heartily at that one. But you get the picture. 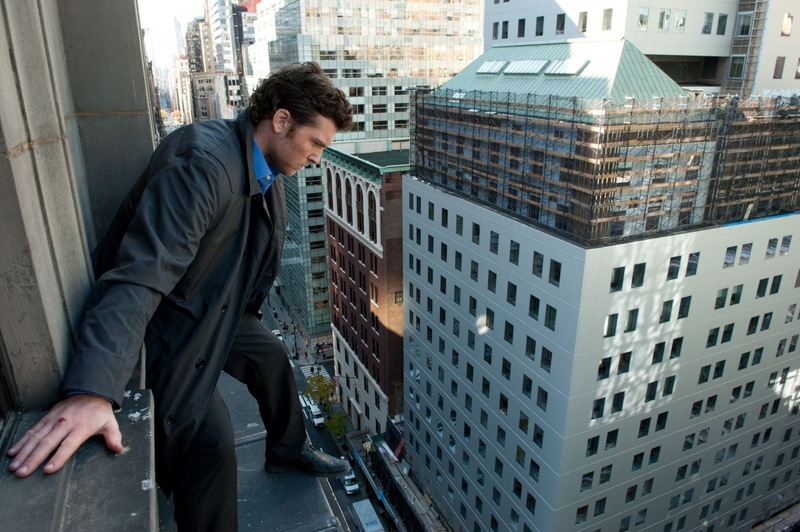 “Man on a Ledge” can be spectacularly stupid at times, but boy are those moments entertaining. It’s not just script stuff, either. Some of the performances are deliriously over-the-top or phoned in. Titus Welliver is horrifically bad as one of the main Police characters, his idea of ‘intimidation’ being chewing loudly on a stick of gum and glaring at everyone around him as though they’re mud on the bottom of his shoes. Funny, funny stuff. 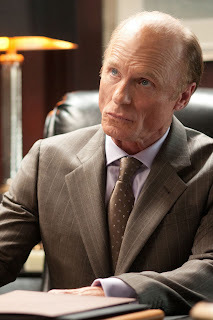 As the villain, Ed Harris really should have been given a moustache to twirl, because that’s his one and only note here. This was clearly a paycheck role for him, and his lack of interest in the proceedings actually makes him a more effectively sickening douchebag. That’s not to say that “Man on a Ledge” is without its positive merits. First-time director Asger Leth does a fantastic job on his debut production; the cinematography is marvelous, making stellar use of the wide anamorphic frame and expertly conveying the height from that ledge; the film induces Vertigo nearly as effectively as the Burj Kalifa scene in “Mission: Impossible – Ghost Protocol.” More importantly, Leth nails the tone, keeping things light enough for the stupid moments to elevate the film, rather than bog it down, yet sufficiently intense and engaging at all times. Henry Jackman’s score plays like demo music from a “Composing for Thrillers 101” class, but it’s a damn good demo, one that keeps things taut and exciting in those crucial edge-of-your-seat scenes. The cast – apart from the notable exceptions mentioned above – is also really strong across the board. I’ve never felt that Sam Worthington – he of “Avatar” fame – was a particularly good actor, but I do think he can deliver a solid ‘movie star’ performance, and this is easily his best one yet. He nails the heightened emotions and deep-seated vulnerability needed for the character, and we come to care for his plight early on, a crucial part of making the story click. Elizabeth Banks is even better as the mediator; as scripted, her character is thin and clichéd, but Banks adds a wonderfully spunky and human personality to the role. 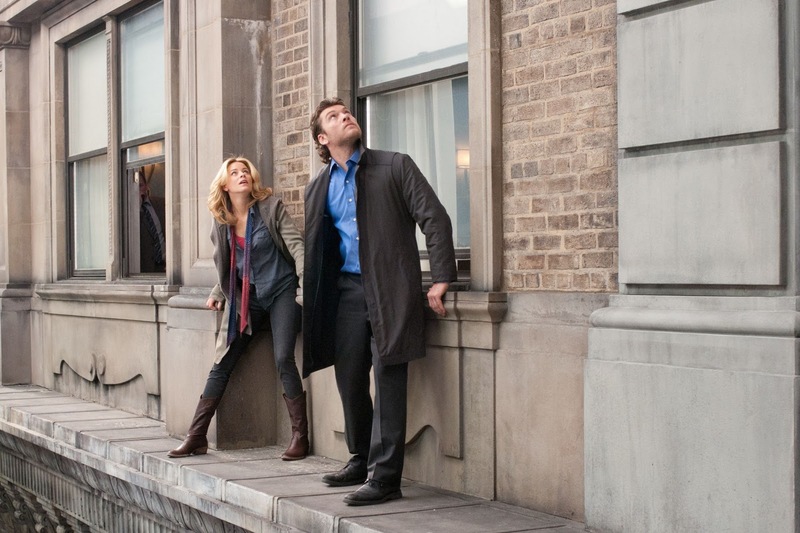 She and Worthington share some absolutely electric chemistry, especially impressive considering that he’s on a ledge and she’s leaning out of a window for most of the run time. Jamie Bell, last seen in digital form as “Tintin,” makes the most of his one-note character – Worthington’s little brother – and Genesis Rodriguez camps it up effectively as Bell’s girlfriend. Anthony Mackie also co-stars as Worthington’s former best friend, and while his part could easily be cut without anyone noticing, that would rob us of having Mackie in the movie, which would be a shame, because he is an effortlessly charming performer. Summit Entertainment is definitely pushing this movie hard; doing public pre-screenings two weeks out from the release date only happens when a studio is seriously confident in their film, but the move makes sense. “Man on a Ledge” will spread some very positive word of mouth, because whether or not you loved it for the same reasons I did – there’s a line of dialogue at the end so ridiculously dumb, so riddled with plot holes, that I was still laughing when the credits rolled – I get the feeling most audiences will embrace this thriller wholeheartedly. Personally? I laughed, I cringed, I was on the edge of my seat, I experienced vertigo, I had the urge to fist pump, and no matter what, I was having fun, sometimes in response to legitimate cinematic merits, sometimes for the so-bad-it’s-good quality, but no matter what, I enjoyed it, every last second, and sometimes, that’s all that matters.